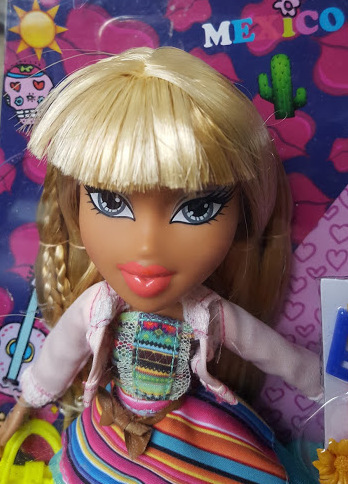 This Autumn Bratz Dolls have had a revamp, and there are a whole host of new releases, including the Bratz Study Abroad range. Cloe, Yasmin, Jade, Sasha and Raya are off to foreign countries to learn more about the world, complete with their bags and cases, souvenirs and a spare outfit to take with them! All of the Bratz dolls have the unique Bratz style, with an overly slim, tall figure and super long hair. It may not be realistic body image at all, but I think promoting the idea that girls can travel the world studying is a great thing for our children to aspire to. My 15 year old was obsessed with Bratz when she was little, I'd have been delighted if it had been able to give her aspirations about future education plans. We've been sent Raya to review. Raya is off to Mexico to live #LaVidaLoca, or maybe just go to college and have a little fun at the same time. She's 'in the box' because it's nearly Christmas! And there's a little girl near me who will love her as she deserves. The outfits are well made with some lovely detail including the belt buckle and 'embroidered' pattern on the jeans. There are plenty of clothes to keep any young person happy, and the accessories including jewellery, bag, flowering cactus and working suitcase really add to play value. 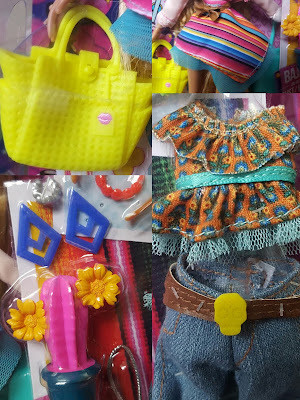 The set also includes a pinata and has a real feel of Mexico to it, hopefully encouraging your child to find out more about Mexican customs and traditions. All of the Bratz are off to study in different parts of the world. Cloe is visiting China, Yasmin is off to Brazil, Jade is travelling across Russia and Sasha is touring the UK - wearing her Union Jack outfit and telephone box earrings. You can find out more about Bratz and the new Bratz app. by visiting the Bratz website - where you can also play games and watch videos, and create your own personalised Bratz doll. Bratz Study Abroad dolls are available now at all good toy shops, including Smyths, The Entertainer, Argos and Toys R Us with an rrp of £24.99. Suitable for children aged around 5+. 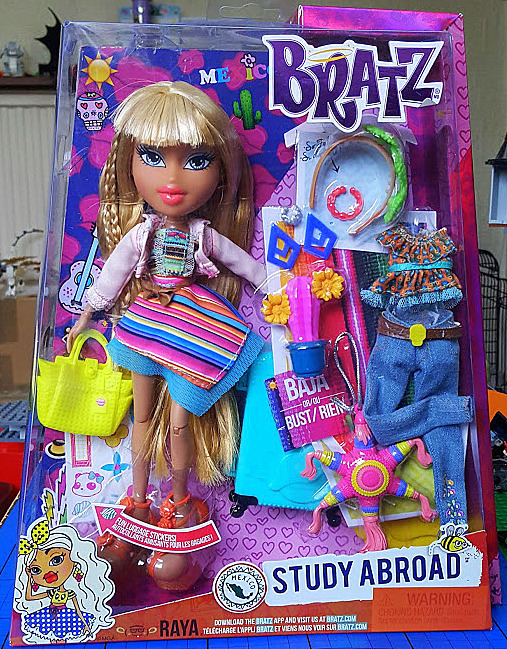 MGA Entertainment have offered a Bratz Study Abroad Raya for one of my readers. Entry to the giveaway is by Gleam form below. I would make an Australian doll and give her a hat with corks and a kangaroo! Finland! 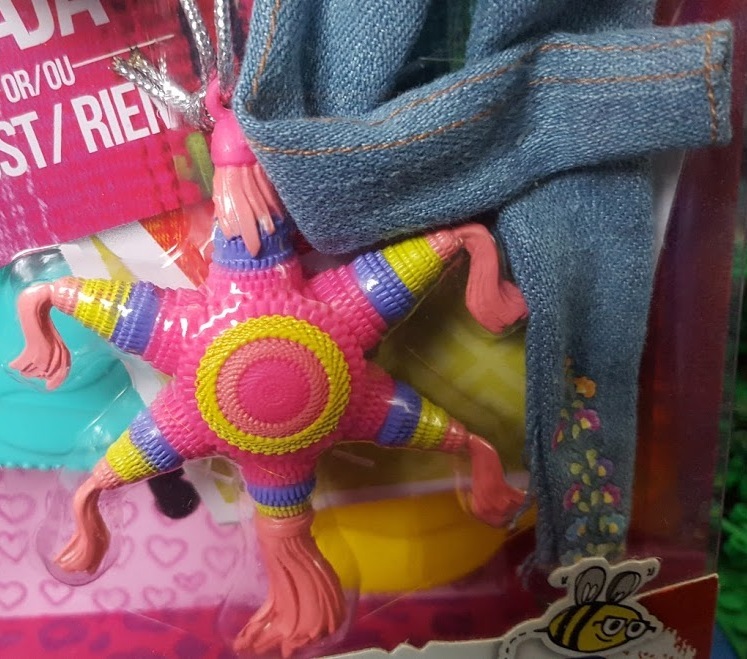 With the Bratz doll wearing warm boots and wrapped up in warm Winter woolies with a hat, scarf and gloves set! switzerland with ski's and chocolate! An Hawaii doll with a hula skirt and flower garland. Liverpool, and she could have rollers in her hair! African safari doll with binoculars, camouflage shorts and maybe some animals like a little monkey. Switzerland with cute ski outfit and mug of hot choc! The USA! They could take a little Statue of Liberty!! Scotland and they should have a kilt, bagpipes and a pet highland cow! The Netherlands, Clogs & Tulips would be cute. France with a beret and a baguette! Ooh, I would definitely like the dolls to go to the Antipodes. The native costumes of both countries are fascinating. The New Zealand doll could have a flax skirt, a feather cape and carry pois and the Australian doll could carry a didgereedo. I think a South Pole explorer doll would be fun with the ski mask and heavy warm clothing. Australia, with a cork hat & suncream! Italy, with lots of designer shoes and clothes! Spain - with a spanish dress and fan. Greenland The doll could come with an Eskimo Coat, husky dog, fish and camp fire. America! They could have an American flag, mobile phone, trucker cap, denim shorts! Holland, they could wear the traditional clogs and those cute dresses. Yorkshire - she could have a flat cap and whippet. Scotland and she would have a wee scottie dog and a tartan outfit! Jamaican :) Of course dreadlocks, rasta hat and rasta bag.